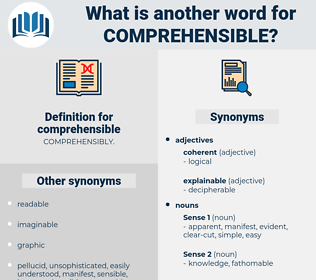 What is another word for comprehensible? clear, conceivable, comprehensive, controllable, user-friendly, reasonable, insightful, perceptible, transparent, coherent, verifiable, justifiable, all-encompassing, sensible, all-embracing, meaningful, obvious, exhaustive, logical, comprehend, accountable, unintelligible, complete, thorough, plain, noticeable, understanding, all-inclusive, visible, inconceivable. Construed, conceived, perceived, interpreted, appreciated. readable, legible, easy-to-understand, accessible, straightforward, understand. exclusive, ambiguous, incomplete, unintelligible, nonunderstandable, obscure, equivocal. incoherent, dark, inarticulate, fathomless, insensible, lost, puzzling, cryptic. Egyptian hieroglyphics are not more comprehensible than the notes we took. To all seven of the ages was this woman comprehensible.